Many of the shimmering colors in a butterfly’s wings are produced not with pigments, like the melanin that tints our skin, but with nanostructures (pdf). The scales on their wings are patterned with nanoscale channels, ridges, and cavities made of a protein called chitin. Unlike pigments, which create color by absorbing some wavelengths of light and reflecting the rest, the nanostructures are shaped so that they physically bend and scatter light in different directions, sending particular colors back to our eyes. That scattering can also make the wing scales iridescent–meaning the color changes with the angle you see it from. When heat, in the form of invisible infrared radiation, hits the chitin nanostructures, they expand, changing their shape and therefore the colors they display. Scientists at GE are working to harness this property to make hypersensitive thermal imaging sensors, useful for night vision. 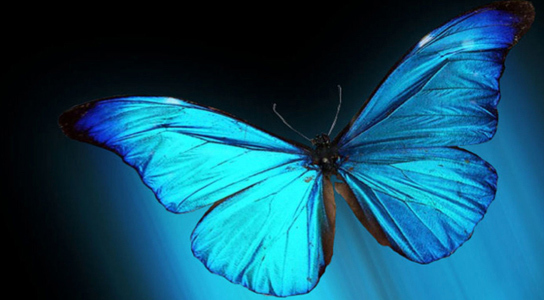 By coating the wings of a Blue Morpho butterfly with carbon nanotubes that magnify the effect, researchers there made an insect into a sensor that changes color when its temperature changes a mere 1/25th of a degree.